Prokaryotic transcription is the process in which messenger RNA transcripts of genetic material in prokaryotes are produced, to be translated for the production of proteins. 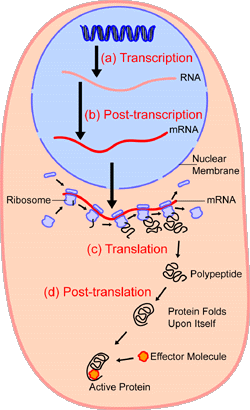 Prokaryotic transcription occurs in the cytoplasm alongside translation. Prokaryotic transcription and translation can occur simultaneously. This is impossible in eukaryotes, where transcription occurs in a membrane-bound nucleus while translation occurs outside the nucleus in the cytoplasm. In prokaryotes genetic material is not enclosed in a membrane-enclosed nucleus and has access to ribosomes in the cytoplasm. Protein synthesis: An overview of protein synthesis.Within the nucleus of the cell (light blue), genes (DNA, dark blue) are transcribed into RNA. This RNA is then subject to post-transcriptional modification and control, resulting in a mature mRNA (red) that is then transported out of the nucleus and into the cytoplasm (peach), where it undergoes translation into a protein. mRNA is translated by ribosomes (purple) that match the three-base codons of the mRNA to the three-base anti-codons of the appropriate tRNA. Newly synthesized proteins (black) are often further modified, such as by binding to an effector molecule (orange), to become fully active. Transcription is controlled by a variety of regulators in prokaryotes. Many of these transcription factors are homodimers containing helix-turn-helix DNA-binding motifs. RNA polymerase (RNAP) binds to one of several specificity factors, σ, to form a holoenzyme. In this form, it can recognize and bind to specific promoter regions in the DNA. The -35 region and the -10 (“Pribnow box”) region comprise the basic prokaryotic promoter, and |T| stands for the terminator. The DNA on the template strand between the +1 site and the terminator is transcribed into RNA, which is then translated into protein. At this stage, the DNA is double-stranded (“closed”). This holoenzyme/wound-DNA structure is referred to as the closed complex. The DNA is unwound and becomes single-stranded (“open”) in the vicinity of the initiation site (defined as +1). This holoenzyme/unwound-DNA structure is called the open complex. The RNA polymerase transcribes the DNA (the beta subunit initiates the synthesis), but produces about 10 abortive (short, non-productive) transcripts which are unable to leave the RNA polymerase because the exit channel is blocked by the σ-factor.The σ-factor eventually dissociates from the holoenzyme, and elongation proceeds. Promoters can differ in “strength”; that is, how actively they promote transcription of their adjacent DNA sequence. Promoter strength is in many (but not all) cases, a matter of how tightly RNA polymerase and its associated accessory proteins bind to their respective DNA sequences. The more similar the sequences are to a consensus sequence, the stronger the binding is. Additional transcription regulation comes from transcription factors that can affect the stability of the holoenzyme structure at initiation. Most transcripts originate using adenosine-5′-triphosphate (ATP) and, to a lesser extent, guanosine-5′-triphosphate (GTP) (purine nucleoside triphosphates) at the +1 site. Uridine-5′-triphosphate (UTP) and cytidine-5′-triphosphate (CTP) (pyrimidine nucleoside triphosphates) are disfavoured at the initiation site. Two termination mechanisms are well known: Intrinsic termination (also called Rho-independent transcription termination) involves terminator sequences within the RNA that signal the RNA polymerase to stop. The terminator sequence is usually a palindromic sequence that forms a stem-loop hairpin structure that leads to the dissociation of the RNAP from the DNA template. Rho-dependent termination uses a termination factor called ρ factor(rho factor) which is a protein to stop RNA synthesis at specific sites. This protein binds at a rho utilisation site on the nascent RNA strand and runs along the mRNA towards the RNAP. A stem loop structure upstream of the terminator region pauses the RNAP, when ρ-factor reaches the RNAP, it causes RNAP to dissociate from the DNA, terminating transcription. In prokaryotes genetic material is not enclosed in a membrane-enclosed nucleus and has access to ribosomes in the cytoplasm. Transcription is known to be controlled by a variety of regulators in prokaryotes. Many of these transcription factors are homodimers containing helix-turn-helix DNA -binding motifs. Additional transcription regulation comes from transcription factors that can affect the stability of the holoenzyme structure at initiation. transcription: The synthesis of RNA under the direction of DNA.